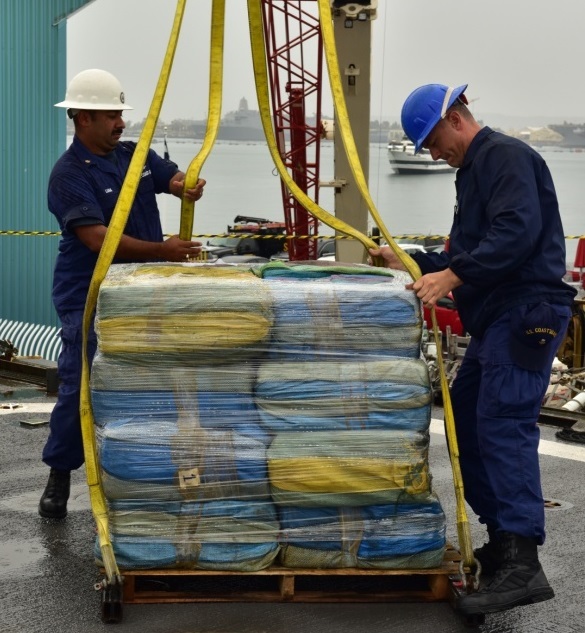 Last fiscal year, Coast Guard crews seized over 455,000 pounds of cocaine worth over $6 billion wholesale. The U.S. Coast Guard cutter Spencer offloaded 10 tons of cocaine and 23 kilograms of heroin at a pier in Port Everglades, Florida – a haul worth a total wholesale value of about $300 million. This represents the results of 13 separate interdictions conducted by six USCG cutters. The Coast Guard and partner agencies remove about 20 percent of drug shipments bound for American shores. On October 4th the Coast Guard landed 50,550 pounds of cocaine and heroin worth more than $679 million wholesale, which then marked a record-breaking year in cocaine seizures for the service. “We’ve tripled our removal rates but there’s a lot more work to be done,” said U.S. Coast Guard Commandant Adm. Paul Zukunft. Nearly 600 smugglers were apprehended by the Coast Guard and turned over to federal authorities for prosecution in the U.S. during the year. That's up from 465 in 2016 and 373 in fiscal year 2015.